When Nintendo Labo was first announced, I must admit I wasn’t exactly ready to jump on board. The general idea was sound and I could see it being popular with young children and perhaps, parents who enjoy crafting things with their children. It wasn’t for me though and when the vehicle kit came around, I still wasn’t ecstatic for it. Now that the Nintendo Labo Toy-Con 04: VR Kit is on the market, it certainly had my interest. Nintendo Switch and Labo VR? I had to check it out for myself. The Nintendo Labo Toy-Con 04 VR Kit comes in two packs. The full kit or the starter kit. I opted for the starter kit as I didn’t have much interest in all the peripherals except one and that was the Toy-Con VR Camera. That of course came in a separate pack along with the elephant peripheral but, I still got both the starter pack and the Expansion kit 1 for just over €50. First things first once I got my hands on both kits, I opened up the starter pack and booted up the Nintendo Labo VR software on the Switch and within minutes, I was putting together my VR Goggles. Fast forward a few hours of crafting and tutorial videos, It was time to actually play some games. Once you build each Toy-Con, you are given the option to try out some of the games. When the VR Goggles are created, you can play some minigames to get the general feel of using VR. Once the Blaster is created, you will be able to blast away aliens in a series of levels. The Camera is my favourite of course, as you get to dive underwater and take photographs of marine life. The games themselves are actually quite fun but they are best played in small doses. There doesn’t seem to be an option to adjust the visual VR settings to make them sharper and easier on the eyes. There were times where my eyes would struggle to maintain focus and I had to come away just to give my eyes a rest. While I have yet to experience headaches, I have had a number of instances with disorientation when taking the VR Goggles off. For something that is made out of cardboard, each peripheral is quite robust. I also enjoy seeing how each part works with another and the how-to videos really help explain things in a very simple manner. While yes, the Nintendo Labo Toy-con 04: VR Kit is designed for Children. I also enjoyed learning how to craft the Toy-Cons and the Joy of using them and entering the Virtual world. This concludes my preview on the Nintendo Labo Toy-Con 04: VR Kit. 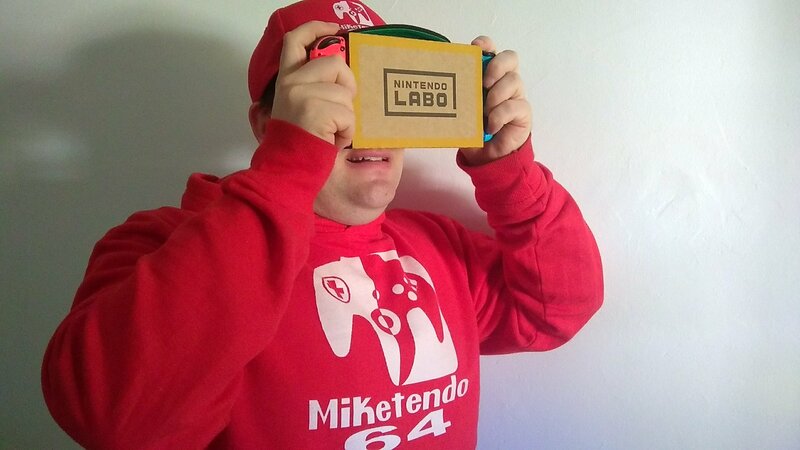 Our Review will be on the way soon but I must conduct much more research on Labo VR before I can write a lengthy report.